Memcached is an in-memory, distributed key-value store for random pieces of application data. It is useful for clustering and distributed caching and it (and similar tools) are becoming an increasingly common feature of large Web-based apps. Memcached is not something that you would generally install on Windows, (not for production anyhow), but it is possible to have it running happily as a native Windows service. 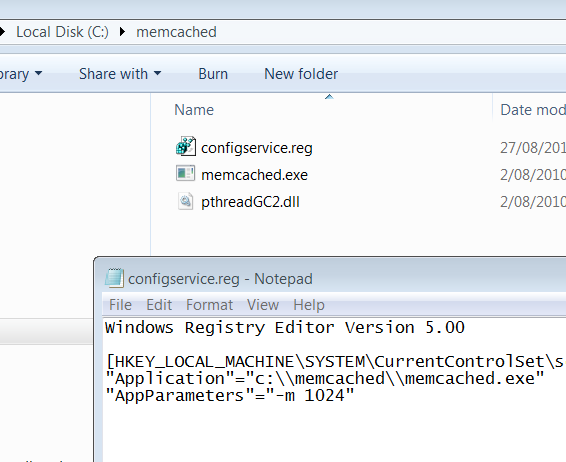 Run memcached.exe and ensure it starts. You should get a blank console window. Ctrl+C will close it, assuming all is well. Install the Windows Resource Kit. For clarity I’ll refer to the install location as “C:Program FilesWindows Resource KitsTools”, in reality it may be different. Substitute your install location as needed. instsrv Memcached "C:Program FilesWindows Resource KitsToolsSRVANY.EXE"
Adjust the path as necessary. You can add (or remove) memcached command line options with the “AppParameters” option. Double click the file in Windows Explorer and merge the settings into the Registry. Also, there is an alternative option – you can use the Java based clone of memcached, (the intuitively/unimaginatively) named jmemcached. This can be used in conjunction with Java Service Wrapper to create Java-based Windows service which operates like the native memcached.